Fit materials: jean, woolens, cotton, velvet. ①Mini sewing machine offers double threads and perfect stitch control. ②Better sight and more convenient in thread cutting. ③Mini size, lightweight, low noise and with an exquisite workmanship. ④This sewing machine is a basic sewing machine, with its easy-to-use feature, suitable for all sewing machine users. ⑤Two power supply methods mustn’t be used at the same time, you need to choose only one method to use. Meanwhile, pedal and switch button can’t be simultaneously used. ⑥Large spool can be used with rewinding device for easy replacement of bottom bobbin. Please confirm that the thread on the machine is wrapped according to the manual, prevent jamming, the direction of the thread-from Left to Right. After confirming the thread is fine, please manually turn down a few laps to ensure that the bobbin can move smoothly. It’s necessary to read the manual and operate according to the manual before using. It can’t sew the over-soft, over-thin or over thick clothes, certain fabrics like thick jeans, leather. If the line is stuck, please stop working immediately, loosen and adjust the thread, sew again till all is fine. If the thread is broken, it could be that the line is too tight, please stop sewing and twist the tension adjusting screw with ease. PORTABLE & CONVENIENT: The mini sewing machine is made of plastic with a perfect size. It is so lightweight that you can hang it on your pegboard in your craft area. DOUBLE SWITCHES: This unique sewing machine has foot pedal switch and a push button hand switch. Operated by ON/OFF button or foot pedal. 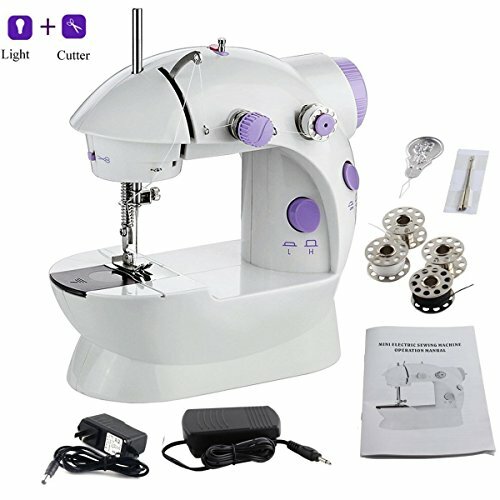 Allows you to sew without a foot control, auto-declutch bobbin winder, easy reverse stitch button and precise thread tension. DOUBLE SPEED: There are 2 speeds with low or high. The speed can be adjusted to ensure that any novice or even a master can work with on their projects in a hassle-free manner. The low speed is suitable for sewing beginner, recommended for ages 13 and up to operate the sewing machine. COMPLETE ACCESSORIES: Mini sewing machine with foot pedal, has light Bulb for working lighting, built-in thread cutter no scissors needed. Will be an ideal gift for birthday, thanksgiving day, Christmas, new year and so on. QUALITY GUARANTEE: We believe in offering the best customer experience. If you have any questions please contact us directly, either operation or quality problem, we would be happy to help you solve it and provide a 6 months replacement guarantee.